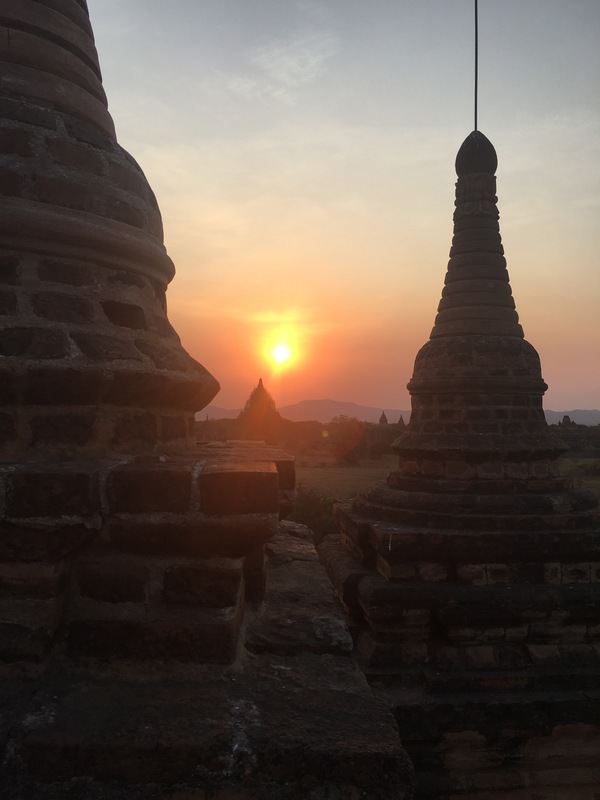 We arrived in Bagan after our 19 hour train journey, not having slept well or eaten. As we pulled in around 10:30am several taxi men jumped on board and offered us rides through the window. Luckily we already had a guide waiting, holding up our names Mike+1. I felt like the extra guest at a wedding. Our guide led us to our vehicle, it turned out we had a 7 seater mini bus all to ourselves. After telling us our itinerary we set off. First stop was a local family run farm on the roadside, where we were shown how palm sugar is collected and turned into sugary sweets and even alcohol (a very strong gin tasting concoction of about 40%). We also took part in grinding peanuts with the family ox, and ate some local delicacies off fermented green tea with various types of nuts. A girl of about 6 also showed us how the paste the women wear on their faces is made from a local tree. 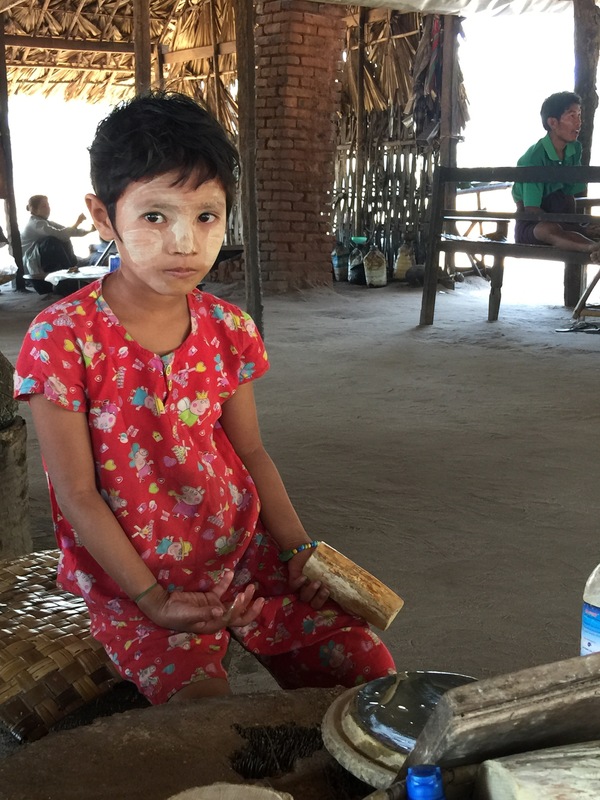 Woman and children all over Myanmar wear the paste as a form of make up to protect their skin. Feeling obliged we bought a bag of palm sugar coconut flavoured sweets and set off to the next destination. A bit of drive later, we arrived at Mount Popa. 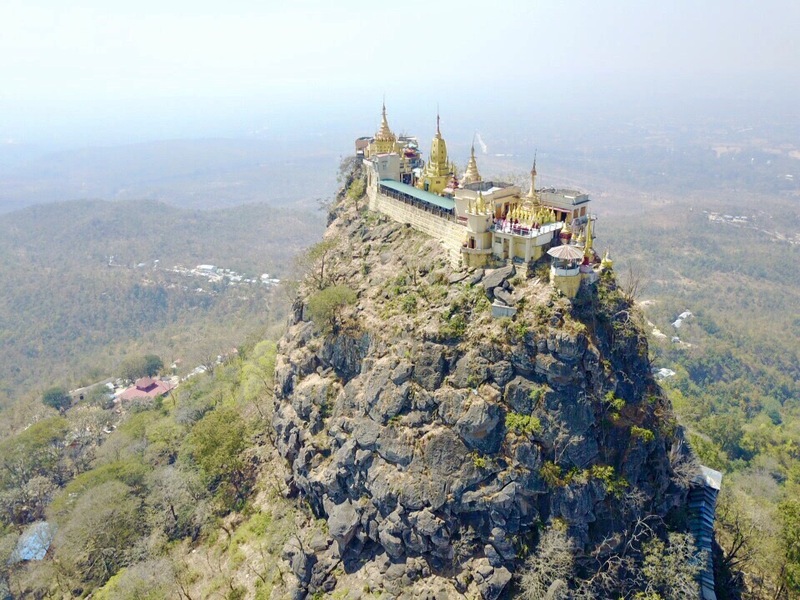 A Pagoda/monastery on the top of a narrow isolated mountain. We stopped and took pictures and Mike flew the drone for some stunning aerial shots. After a short drive we began climbing the 700+ steps up to the top (with about 500 locals). Monkeys accompanied the climb discarding the peanuts people were feeding them and stealing more precious treats. At the top where golden Pagodas and many Buddha in various poses, plus a statue of an elephant and holy man where people lay giant flip flops as an offering. Strange. Next we visited an 18th century teak monastery. Beautiful carving and work went into its construction. The monastery was closed but our guide got us in under the pretence of using the toilet, much to the protest of other tourists! We also visited a large sitting Buddha that had started life further north but had been washed down a river and restored and now sat here. We then headed for Began, the home to over 3000 Pagodas and temples. It was approaching sunset and our guide showed us to a quieter temple we could climb for sunset. Mike again flew the drone and we began to get an understanding of the scope of the area and just how many temples there were. Sunset was beautiful as it slowly descended behind a large temple. Several snaps later we drove nearby to our hotel in Bagan town. A pleasant hotel with intermittent slow wifi. 5am our alarms went ready to see sunrise from a different location (there are 3000 temples to choose from!). This one you could climb the outside rather inside. Several tourists had already scrambled up and found the best locations. While I snapped on the iPhone and camera Mike flew the drone again. Once the sun had risen hot air balloons filled the sky. Coming from the south they rose slowly and made for great pictures. I had never really seen hot air balloons up close as they roared over head. After the early start we went back to hotel for breakfast and set out a couple of hours later. First we visited the local market. Our knowledgeable guide explained all the unusual fruit and vegetables as we walked. The market also was home to many craft stalls, from brass to clothing to lacquer wear. Next we were lucky enough to be in the town centre for an initiation ceremony. Between the ages of 7 and 15 children have to spend time in a monastery run by monks, for a minimum of about 10 days. Before they go a big parade in traditional costumes and trip to the biggest pagoda take place. Many families join together to send of their boys and girls and most of the town join in the celebration. The parade featured cars, horses and even three elephants all decked out in traditional dress. The cost of these vary but our guide advices the one we were witnessing was about $40,000! The elephant alone to rent are expensive. What is funny how we was the faces of the children, they were not excited or smiling, but glum. Perhaps because they have to spend time away from their family or that tomorrow they’ll have their head shaved! The next few hours till sunset were taken up exploring some of the 3,000+ temples and pagodas. 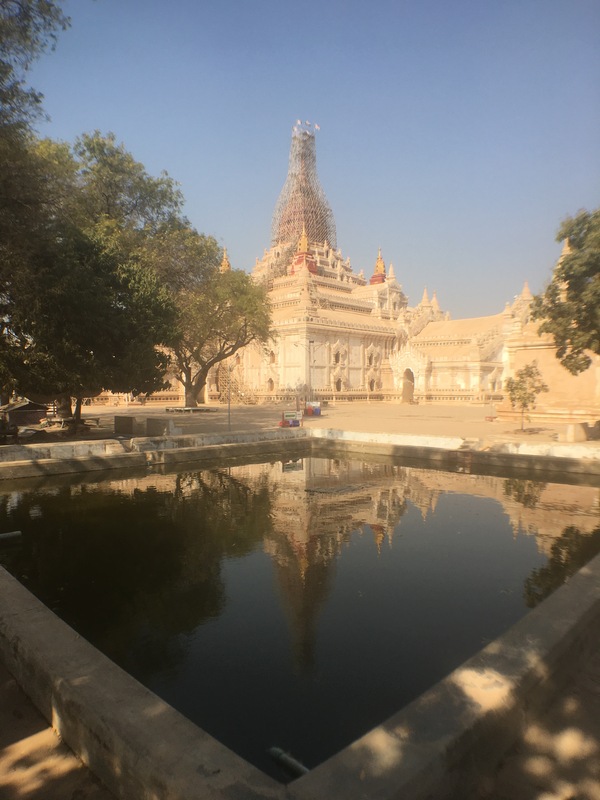 We visited the biggest, the tallest, the one covered in the most gold, some very close together, some with amazing Buddha statues inside, some completely abandoned. Each had its own history and importance. After a while they all blurred into one, but it was a very enjoyable few hours hearing about their history and the Buddhist religion. Over the course of the afternoon we also visited a family run lacquer wear shop. Here we saw the labour intensive process to turn bamboo into beautiful works of art. The skills by the workers was outstanding, for something we assumed had been made in a factory. The detail of the hand carved designs was mind blowing. It made us both feel rather under skilled. We again felt obliged to buy and parted with a few too many dollars. Sunset approached quickly and instead of climbing a temple we watched from a private boat on the river. Mike flew the drone from the boat with disastrous consequences. The boat appeared not be moving but I guess it was gently drifting. When the drone took off it lurched forward colliding with he boat railings, somehow it stayed upright as our hearts sank. After a few minutes of flying it wasn’t happy over water so mike attempted to land. Again as the boat was drifting it didn’t want to a kept pulling back. Plus railings, flags and poles to keep clear of the avoidance detection was going haywire. Eventually after several attempts and flybys it landed on the roof of the boat. In all the drama we had almost missed the sunset. Grateful to have it back we headed back to shore. We waved goodbye to our guide Tun Tun who had been amazing for 2 days, his English was excellent and his knowledge even better. 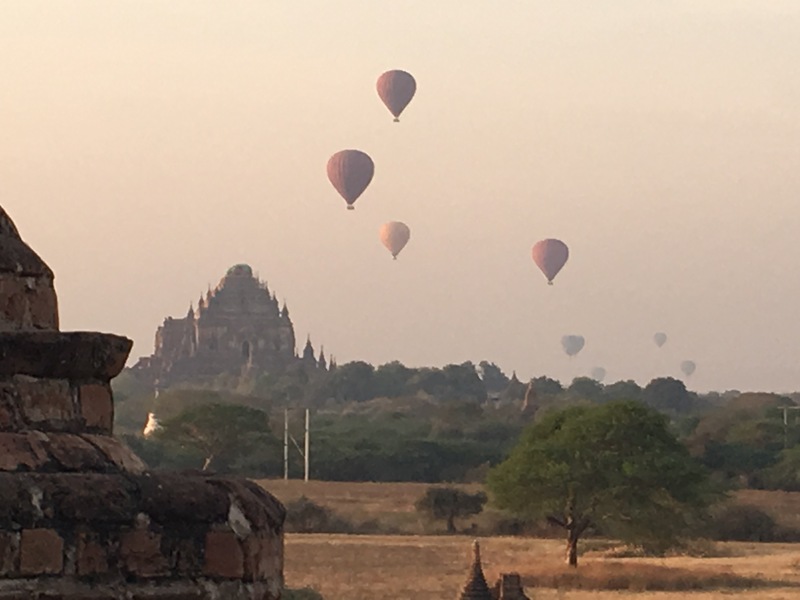 Next stop was Mandalay after an early morning flight.